Growing up in Hawaii, Kamala Saxton regularly ate Spam as a comfort food, whether as a part of a mixed plate with rice and eggs, in a “musubi” dressed with seaweed, or in her grandmother’s kimchi stew. But when she started her food truck, Marination, with business partner Roz Edison in 2009, the Seattle-based restaurateur found that diners on the mainland — and some of her staff — were apprehensive about the dishes featuring the canned meat. What's your favorite way to eat Spam? 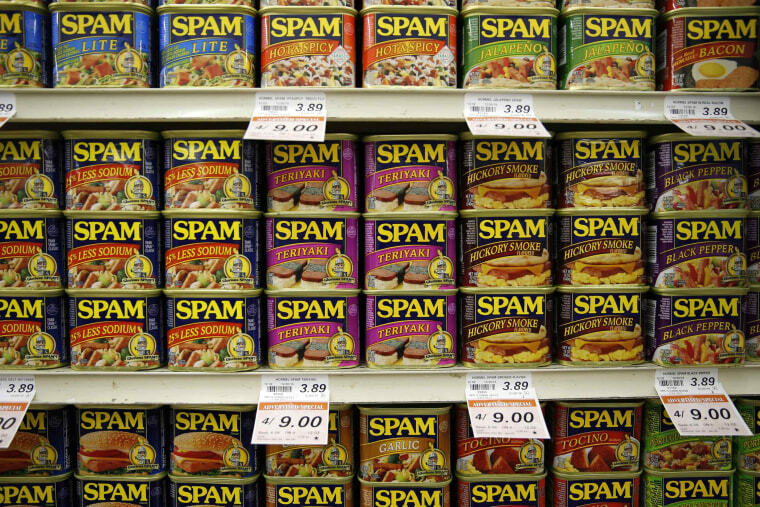 Spam — the canned luncheon meat that can be served hot or cold, on a bed of rice, sandwiched in bread, and in stews, fried rice, or sushi — turns 80 Wednesday. Over its eight decades, the meat has found prominence with Hawaiian, Pacific Islander, and Asian-American eaters and chefs due in part to its ubiquity during World War II. According to Hormel Foods, Guam residents consume on average 16 cans of the meat per year, and Hawaii is home to one of the world’s largest festivals celebrating the food. Saxton praised Spam for being "the perfect luncheon meat." "It's salty, a little sweet. However you want to service it, it's durable," she said. "In the Pacific Northwest, you can put it in your backpack when you go hiking in the morning, and it's still good by the time you want lunch." On Marination’s menu, Spam appears in a slider seared with a teriyaki glaze and dressed with a Korean chili paste-based “Nunya” sauce and a pickled ginger slaw as well as in the form of a self-contained "musubi" with rice and seaweed. Kapur makes his own in-house version of the luncheon meat at Liholiho, which is served with rice in a nod to musubi as well as in a fried rice and as the pigs in a pigs in a blanket. While making his version of the meat, Kapur strove to get as close as possible to the classic while also controlling the sourcing of his product. For Filipino-American chef Dale Talde, author of cookbook “Asian-American: Proudly Inauthentic Recipes from the Philippines to Brooklyn,” Spam was a regular pantry item growing up, and he still uses it at home, most often as one of the ingredients in his kimchi fried rice. While he said there can be some negative connotation connected to Spam, he feels critics overlook the ways it can be transformed. While some of Kapur’s diners come into his restaurant without an idea of what Spam even is, he said that much of his diverse clientele is used to the product and treats it like any other protein. Saxton agrees. While Marination’s Spam sliders were among the worst sellers when the food truck first debuted, it’s now one of its best, she said. Return the skillet to medium-high heat, then add the remaining tablespoon of canola oil and the cubed Spam. Cook the Spam, stirring occasionally, until it's golden brown on all sides, about 3 minutes. Add the diced onion and minced garlic, stir everything together, and continue to cook over medium high heat just until the onion has started to soften, about 2 minutes more. Make sure to stir often, so that the garlic doesn't burn. Add the chili flakes, sesame oil, kimchi, and butter, then stir everything together and cook for about a minute, just to heat the kimchi. By now, the mixture may have started to stick to the skillet. Add the reserved kimchi liquid (about 1/3 cup) and stir to deglaze the skillet (the liquid will release all the stuff that's stuck to the bottom). Add the cooked rice, stir, then add the cooked egg, sliced scallions, and fish sauce (optional). Stir thoroughly so that the egg is in bite-sized pieces and everything is evenly distributed throughout the rice. Turn the heat to low to keep the rice warm while you fry the eggs, stirring every minute or so to keep the rice from sticking. Melt butter in a large nonstick skillet over medium-low heat. (If you don't have a large nonstick skillet, use a small nonstick skillet and work in two batches.) When the butter is melted, crack the eggs into the skillet. Try to keep them separate but if the whites touch, that's OK.